1 pair of 38 liter boxes complete with mounting brackets installed. Basic outside dimmentions are 22" long, 17" tall and 9 3/4" wide. Weight per box with all stainless steel mounting hardware is 11 lbs. The Mule Pack Panniers are molded from high-density polyethylene (the same material used for white water kayaks and highway road barriers) and are virtually indestructible. 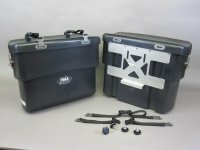 These boxes are designed to provide safe, dry, and secure storage for all your gear. The overlapping lid joint and marine grade gasket keeps out the dust and water. The latches can be locked. The top of each Mule Pack is contoured—making it easy to attach tents and sleeping bags on top of each pack with the included buckled straps. Free shipping lower 48 states, international and expedited shipping available.